Robyn R. Jackson, PhD, is a former high school teacher and middle school administrator. She is currently the President and Founder of Mindsteps Inc., a professional development firm for teachers and administrators that provides workshops and materials designed to help any teacher reach every student. 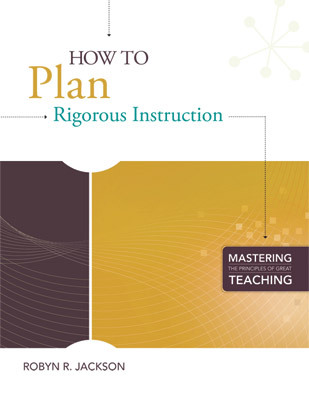 Dr. Jackson is the author of Never Work Harder Than Your Students and Other Principles of Great Teaching, The Differentiation Workbook, and The Instructional Leader's Guide to Strategic Conversations with Teachers, as well as the how-to guides in the Mastering the Principles of Great Teaching series. You can sign up for Dr. Jackson's monthly e-newsletter at www.mindstepsinc.com, follow Dr. Jackson on Twitter at @robyn_mindsteps, or reach her via e-mail at robyn@mindstepsinc.com. Copyright © 2011 by Mindsteps Inc.. All rights reserved. No part of this publication—including the drawings, graphs, illustrations, or chapters, except for brief quotations in critical reviews or articles—may be reproduced or transmitted in any form or by any means, electronic or mechanical, including photocopy, recording, or any information storage and retrieval system.